On 1 December, IADC issued a press statement in response to the US Senate Committee on Energy and Natural Resources hearing on both the BSEE well control rule and the Arctic rule. Danielle Blacquiere recently joined IADC’s Conference Team as Conference Coordinator, Eastern Hemisphere. In her position, she will assist the Eastern Hemisphere Conference Department with IADC events and will provide general support for IADC conference activities in Europe. Ms Blacquiere has a degree in International Event, Music and Entertainment Studies from the Communications Institute in Tilburg, The Netherlands. She is fluent in Spanish, German, English and Dutch. She can be reached at her IADC email address, Danielle.Blacquiere@iadc.org. API is currently in the process of revising Recommended Practice for Occupational Safety for Oil and Gas Well Drilling and Servicing Operations (RP 54). The RP includes procedures for promotion and maintenance of safe working conditions for employees engaged in rotary drilling operations and well servicing operations, including special services. It applies to rotary drilling rigs, well servicing rigs and special services as they relate to operations on locations. The meetings are open and participation by IADC onshore contractor members is encouraged. OSHA attends the meetings, viewing the revision as both a future reference document and a major endeavor for industry. For information about upcoming meetings, please contact Roland Goodman at goodmanr@api.org. In an effort to develop a mutually beneficial relationship with suppliers, the IADC Supply Chain Committee has created a suite of standard supplier metrics and a scorecard template to align expectations and promote performance improvement throughout the entire procurement to pay process in the drilling industry. Using the IADC Supply Chain Committee scorecard, drilling contractors are able to input data collected from the metrics, helping to promote consistency on the measurement of key performance indicators by both drilling contractors and suppliers. Any and all data collected from these metrics is strictly confidential and will not be shared with anyone other than each drilling contractor and its suppliers. The metrics and the scorecard template were developed by the IADC Supply Chain Committee to assist drilling contractors and suppliers in performance improvement discussions. The metrics document and scorecard can be accessed via the IADC website. On 9 December, representatives from IADC attended the STEPS of PA meeting. The Pennsylvania chapter is one of 22 chapters of the National STEPS Network, which is an HSE-driven network whose goal is to share lessons learned. The meeting was held in State College, Pennsylvania, with approximately 100 members of the STEPS of PA organization in attendance. Mark Denkowski was invited to present on IADC’s WellSharp well control training and assessment program and the Gateway™ program. The goal for each of the STEPS Chapters is to align with local OSHA personnel to form a closer working relationship between industry and OSHA. OSHA personnel regularly attend chapter meetings across the country to present regulatory updates and give general policy guidance. Representatives from IADC will return to Pennsylvania to co-sponsor the 27 January meeting in State College. Visit the STEPS of PA website for more information about upcoming meetings. — Q4: ”Innovations in Drilling Safety”, 9 November. Host/location TBD. DEC encourages submission of abstracts for the forums. Send your ideas to Leslie.Packard@iadc.org or mike.Killalea@iadc.org. IADC staff and a select team of contractor technical experts from Independence Contract Drilling, Patterson UTI and Precision Drilling have continued to meet with Texas Railroad Commission (TRRC) representatives in an ongoing effort to clarify certain provisions of TRRC Statewide Rule 13. Statewide Rule 13 is related to well control equipment used by onshore drilling rigs operating in the State of Texas. The most recent deliberations were completed in early December, with the TRRC agreeing to further examine clarifications applicable for onshore contractor compliance. If accepted, the clarifications are estimated to be posted to the TRRC website Rule 13 FAQ page in early 2016, with a similar posting in IADC media and publications. 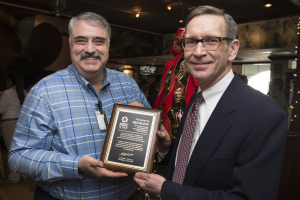 Ben Bloys (left), longtime Chairman of the IADC Drilling Engineers Committee and its predecessor the Drilling Engineering Association (DEA), is honored with a plaque presented by Keith Lynch of ConocoPhillips, Mr Bloys’ s successor to the DEC chair. Mr Bloys is a seasoned drilling engineer and serves as Chevron’s Manager of the Chevron-Los Alamos Technology Alliance. Mr Bloys was instrumental in reinventing DEA as the DEC and bringing it fully into IADC. He said that he intends to continue to participate in the DEC.
Marine & Oil Services (Maroil Sarl), Abidjan (Conditional).